This inserts the number of rows equivalent to the amount of data we’ve got. Note: The above snippet is using .insertRowsAfter(). Another method is .insertRows() but this will throw an error if the row you are trying doesn’t exist.This is an issue if you only have a header row and you want to insert rows after it. As part of this we are using the loop iterator to build the R1C1 reference, which can get messy if you are appending rows at the end of your data. 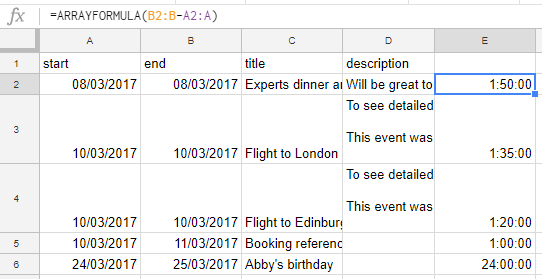 Another way of doing this is using the ARRAYFORMULA() built-in to Google Sheets. There are plenty of tutorials for using these, like this one from Ben Collins, out there and I won’t go into more detail here but one example for our first code sample would be to include =ARRAYFORMULA(B2:B-A2:A) in cell E2. The pattern for building a .setValues() array makes several assumptions including the order and position of the columns we use remains unchanged. In the case of data from services like CalendarApp I haven’t discovered any useful patterns so if you know any please share. In the above example there are data values that are more than one level deep. As a sheet is 2D we need to flatten the data. Bruce McPherson has a nice pattern for flattening an object with dot syntax, which he has wrapped in a Flattener library (source code on Github). Bruce also has developed the functionality of these scripts further with a Fiddler class as part of this cUseful library and provided some ‘Fiddling APIs to Google Sheets’ examples (I can’t see a ‘flatten’ method in Fiddler so you probably have to use them in combination). Next Post: Virtual Teams: An open perspective on organisational transformation?